TianGong (“Sky Palace”) is a two-module, temporarily man-tended orbital station, capable of flying on autonomous mode without astronauts onboard. Astronauts will be visiting and tending the station on a short-term basis during its designed life of two years. TianGong was based on the ShenZhou manned spacecraft design, with a slightly increased mass. The space station is launched by a ChangZheng 2F/G launch vehicle from the Jiuquan Satellite Launch Centre (JSLC). A total of three TianGong missions are planned between 2010 and 2015, during the second phase of the Chinese Manned Spaceflight Programme (Project 921). The first mission, TianGong 1, is scheduled in October 2010. The spacecraft will be serving as a ‘target spacecraft’ to perform three rendezvous docking operations in the orbit with ShenZhou spacecraft. The first docking operation will be carried out with the unmanned ShenZhou 8 spacecraft, followed by two docking operations with the manned ShenZhou 9 and ShenZhou 10 spacecraft. TianGong 1 may not be equipped with a life support system for astronauts to stay. The second mission, TianGong 2, will launch the first fully-operational space station around 2013. The space station will be equipped with a life support system that allows astronauts to stay onboard for a short period of time. During their stay, astronauts will be carrying out a range of tasks including earth observation, space science research, and space medical research and experiments. The space station is scheduled to be docked with two manned spacecraft, ShenZhou 11 and ShenZhou 12, during its two years stay in the Low Earth Orbit. The third mission, TianGong 3, will launch a space station similar to that in the TianGong 2 mission, but with a more sophisticated and capable life-support and recycling system in order to support longer stay of astronauts. The spacecraft will be fitted with two or more docking ports to allow a ShenZhou spacecraft and a cargo spacecraft to be docked at the same time to form a primitive multi-module space station, an essential step toward building a permanent space station in the next phase of China's manned space programme. The TianGong orbital station features a two-module design, including a habitable living module to accommodate visiting astronauts, and a service sector to provide power supply for the spacecraft. A docking port is fitted at the end of the living sector. The whole spacecraft weights 8.5 tonnes and is launched by a CZ-2F/G launch vehicle. The TianGong design will also be used to develop an unmanned cargo spacecraft, which will be fitted with rendezvous and docking port and used for resupply and refuelling of future space stations. The spacecraft will be launched from the newly-built Wenchang Satellite Launch Centre in the Hainan Island. Is this real or is this more fake space walks? It will be launched in 2011 ( plan )...They are doin the renovation of ground equipment at the moment. I personally think that it's real, but it will probably have some delay. "Is this real or is this more fake space walks?" solo.13mmfmj wrote: "Is this real or is this more fake space walks?" When they say they will and never go out into space. Did the Chinese had any real maned space missions or real space walks? XICHANG, Sichuan, Oct. 1 (Xinhua) -- China's lunar probe Chang'e-2 was successfully launched, control center at the Xichang satellite launch site in southwest China's Sichuan Province announced Friday. Chang'e-2 arrived at an earth-moon transfer orbit after it separated from the carrier rocket, which has a perigee of 200 kilometers and an apogee of about 380,000 kilometers from the earth, according to the control center. The control center made the announcement after the satellite successfully entered the orbit and unfolded its solar panels. At 6:59:57 p.m., the satellite blasted off on a Long March 3C carrier rocket from No. 2 launch tower at the Xichang Satellite Launch Center. The lunar satellite is expected to take about 112 hours, or almost five days, to arrive at its lunar orbit. The space program of the People's Republic of China is directed by the China National Space Administration (CNSA). Its technological roots can be traced back to the late 1950s, when the People's Republic began a rudimentary ballistic missile program in response to perceived American (and, later, Soviet) threats. However, the first Chinese crewed space program only began several decades later, when an accelerated program of technological development culminated in Yang Liwei's successful 2003 flight aboard Shenzhou 5. This achievement made China the third country to independently send humans into space. Plans currently include a permanent Chinese space station in 2020 and crewed expeditions to the Moon and Mars. This has been followed by further space exploration achievements, including an Earth-orbiting laboratory called Tiangong-1 and a lunar rover named Jade Rabbit. But is it all a front to build anti-satellite technology? That’s what one expert warns we should be wary of, and not just from China, but Iran and North Korea as well. In a paper called Dangerous Space Incidents, Micah Zenko of the Council on Foreign Relations explains how satellites could be under threat from the rising space exploration capabilities of certain nations. Such fears are not without precedent; on 11 January 2007 China infamously carried out an anti-satellite missile test, destroying one of its own satellites at a height of 537 miles (865 kilometres). Aside from resulting in thousands of pieces of dangerous space junk, which remain a problem today, the stunt also highlighted how under vulnerable some of the essential satellites run by Western nations are. Zenko points to the large amounts of assets held by the US in space that could be prone to attack. These include satellites for national and global security. He says that, if a satellite were to be attacked either inadvertently or on purpose, it could fuel an international crisis. Given the high reliance of the US on satellites, he says the country needs to invest in mitigation measures in the event of an incident from one of a handful of protagonists. ‘Based on capabilities, intent and history of malicious or destabilising behaviour, the state most likely to undertake destabilising actions is China, followed by North Korea and Iran,’ Zenko continues. The evidence for such motives can apparently be seen in previous rocket launches. On 13 May 2013, for example, China launched a rocket from the Xichang Satellite Launch Center in Sichuan Province. It was, they say, a high-altitude scientific research mission. But according to Brian Weeden of the Secure World Foundation and a former US Air Force space analyst it was actually a test of a new ballistic missile. He says government sources indicated China tested a kinetic interceptor launched by a new rocket that could reach geostationary orbit about 22,500 miles (36,000 kilometres) above Earth, a region used by surveillance satellites. ‘If true, this would represent a significant development in China’s anti-satellite (ASAT) capabilities,’ he said. ‘No other country has tested a direct ascent ASAT weapon system that has the potential to reach deep space satellites in medium Earth orbit, highly elliptical orbit or geostationary orbit,’ he continued, referring to orbital paths that are above 1,250 miles (2,000) kilometres. The solution, according to Zenko, is to push for more transparency when it comes to rocket launches. For countries like North Korea and Iran, the former of which put its first satellite into space less than two years ago, we know even less about their capabilities. As popularised in the movie Gravity, there is a large amount of space junk in orbit that could become a growing problem if more satellites are destroyed. With it becoming cheaper and easier to get into space, a scenario where more and more space junk is created, known as the Kessler syndrome, becomes a greater threat. Aside from the purported test last year Zenko says China has carried out five other anti-satellite ‘missile tests’ in the past. ‘It has conducted ASAT [anti-satellite weapon] tests without warning and signalled intent to undertake malicious actions,’ he says. He says something similar to the United Nations Convention on the Law of the Sea, which defines nations rights and responsibilities in regards to using the world’s oceans, is needed for space. Iran, for example, is thought to use lasers and jammers to interfere with US military and commercial space systems with no repurcussions. Accoring to Zenko, these actions could be misinterpreted as an act of aggression. A ‘Law of Space’ would prevent such a misunderstanding occurring. Ultimately, the US and other nations need to set in stone plans ‘to mitigate or prevent dangerous space incidents and limit the multiplication of space debris that threaten US space assets,’ concludes Zenko. ‘On the current path, the likelihood of potentially dangerous space incidents will only increase, whereas a renewed focus on preventing and mitigating such events would markedly reduce this threat. TAIPEI — US defense experts and the US State Department are describing China’s successful July 23 so-called “anti-missile test” as another anti-satellite test (ASAT). It is the third such kinetic strike ASAT launch by China and raises fears the US will be unable to protect its spy, navigation and communications satellites. “This latest space interceptor test demonstrates a potential PLA [People’s Liberation Army] aspiration to restrict freedom of space flight over China,” said Mark Stokes, a China missile specialist at the Project 2049 Institute. China’s first two anti-satellite tests, 2007 and 2010, involved the SC-19 (DF-21 ballistic missile variant) armed with a kinetic kill vehicle. Though the first two involved the SC-19, only the 2007 ASAT actually destroyed a space-based platform. The 2010 and July 23 test successfully struck a ballistic missile. With the destruction of the weather satellite came international complaints that China was unnecessarily creating a debris field that would endanger other nations’ space platforms. This could explain the reason China chose to shoot down ballistic missiles rather than hitting orbiting platforms. Not everyone is convinced China is developing an ABM system. Hans Kristensen, the director of the Nuclear Information Project for the Federation of American Scientists, is one of them. “The first [observation] is wondering why China is spending effort and money on developing an anti-ballistic missile defense system given the enormous challenges and expenses the United States and Russia have had to dedicate to their efforts over the years with only partial success to show for it?” He said it seems highly unlikely that Chinese engineers would suddenly be able to overcome those challenges and deploy an effective ABM system. Kristensen said his second observation is that a Chinese decision to develop and deploy an ABM system seems contradictory to China’s well-known opposition to US missile defense plans in the Pacific. He does not believe that a Chinese missile defense system would be able to counter the advanced and large US and Russian nuclear missile forces. It would be a somewhat different matter with India. Fisher contends that China is working on anti-satellite and ABM programs at the same time. It is also possible that the SC-19 has both an ASAT and ABM capability, as demonstrated in the 2007 and 2010 tests. Fisher said the new HQ-19 and the HQ-26 could be similar in capability to the US Terminal High Altitude Area Defense system. There are also reports out of China indicating Beijing is attempting to procure Russian S-400 low-altitude ABMs, he said. Fisher said the larger issue could be that after nearly three decades of “scorching harangues” by China on the US missile defense program, China has all along been developing its own ballistic missile defense system. CARACAS, October 6. /TASS/. China and Venezuela have signed an agreement on construction and launch of Venezuela’s third satellite to the orbit. The space satellite will have the name of Antonio Jose de Sucre, a leader of war for independence from Spain in South America. Venezuela’s first satellite, which was also manufactured in China, was called Simon Bolivar. It was taken to the orbit in 2008 to provide telecommunication support for social projects, including those in healthcare and education. The second satellite, Miranda, was launched from China in 2012. It is used in Venezuela to monitor the national territory and to update the country’s maps every 40 days. The parties in the agreement are Venezuela’s Ministry of Higher Education, Science and Technologies and China’s Great Wall Corporation. BEIJING, October 8. /TASS/. China plans the 2019 launch of a series of maritime surveillance satellites to monitor ships, drilling platforms, coastal and sea resources and natural disasters, Chinese news agency Xinhua reported on Wednesday. The Haiyang-3 satellites will use radar technology to allow monitoring at any time of the day and through any weather conditions, deputy director with the national satellite ocean application service Lin Mingsen said. They will be able to see meter-long objects from space and generate high-definition images of land and sea. “These satellites will play an important role in stronger protection of Chinese marine rights, protection of law and order at sea, use of marine resources and monitoring and control over rescue operations away from the country’s coast,” Xinhua quoted Lin as saying. The module is set to make its second and third braking maneuver on January 12 and 13 respectively to enable it to enter the target 127-minute orbit for testing technologies which are vital for the success of the country’s first lunar mission, Chang’e-5. MOSCOW, January 11 (Sputnik) — The service module of China’s unmanned test lunar spacecraft successfully entered orbit in Sunday after slowing down, the Beijing Aerospace Control Center reported. According to instruction, the module decelerated and entered an 8-hour elliptical moon orbit with a perilune of 200 kilometers and an apolune of 5,300 kilometers. According to the center, the orbiter has sustained balanced energy and is in good condition. Tracking of the service module was stable, and relevant tests were carried out smoothly. The module is set to make its second and third braking maneuver on January 12 and 13 respectively to enable it to enter the target 127-minute orbit for testing technologies which are vital for the success of the country’s first lunar mission, Chang’e-5, center’s chief engineer Zhou Jianliang said. "The first braking is the most crucial," Zhou said as quoted by Xinhua news agency. "Precise braking must be performed at perilune to prevent it from flying away from the moon." The lunar orbiter was launched on October 24. It reached the Earth-Moon second Lagrange Point in late November and left it on January 4 after completing all preset tasks. The probe Chang'e-5 is expected to be sent to the Moon, collect samples and return to Earth in 2017. The Chinese Lunar Exploration Program has a three phase design. The first phase was aimed at orbiting the Moon, with the second phase having the objective of making a soft landing, while the third phase purports to bring a sample of the lunar surface back to Earth. Chang’e-5 is expected to be sent to the Moon, collect samples and return to Earth in 2017. BUENOS AIRES, February 26. /TASS/. Argentina’s Congress has approved Wednesday the installation of a Chinese satellite tracking station in one of the South American country’s regions. The measure passed the lower house with 133 votes in favor and 107 votes against. China plans to install a satellite tracking system in the Neuquen province, investing $300 million in the project that is said to be part of Beijing’s ambitious Moon program. The station will become operational in 2016. Argentina will, however, receive access to the station’s 35-meter antenna for its own research projects. The lawmakers that voted against the installation questioned the possible military use of the base. Last October, Argentina became the first Latin American country that launched its first domestically built geostationary communications satellite ARSAT-1. It provides several telecommunications services, Internet and telephony in Argentina, Chile, Uruguay and Paraguay. The “Jade Rabbit” discovered at least 9 subterranean layers beneath the lunar surface, 5 more than was previously thought. Scientists believe the layers are a result of ancient lava flow between strata of regolith, the moon’s soil. "One is [that] more volcanic events have been defined in the late volcanism history of the moon. Another is the lunar mare [volcanic plain] area is not only composed of basaltic lavas, but also explosive eruption-formed pyroclastic rocks"
"The latter finding may shed light on … the volatile contents in the lunar mantle," he said. China’s Chang’e-3 spacecraft landed on the moon in December 2013 and dispatched Yutu to study the landing site, Reuters reported. It ended up near a relatively fresh crater in a region known as Mare Imbrium, a site much younger than those explored by NASA’s 1969-1972 Apollo landing sites and those explored by Soviet lunar missions. It is now believed, based on the results of the Yutu mission, that eruptions of lava have filled the Imbrium basin at least five times, forming layers of basalt rock. Yutu’s radar detected at least five of these layers within the top 1,312 feet of the moon’s surface. The annual DoD report to Congress, titled Military and Security Developments Involving the People’s Republic of China, comes as some in the US Air Force are calling for a more robust defense of US space assets. The US has more than 500 satellites which, according to the USAF, are increasingly exposed to threats from China’s rapidly expanding space program and so-called "counterspace" technologies. "China possesses the most rapidly maturing space program in the world," the report said. It goes on to add that in parallel with the program, the country continues to "develop a variety of capabilities designed to limit or prevent the use of space-based assets by adversaries during a crisis of conflict, including the development of directed-energy weapons and satellite jammers." The news is likely to alarm Western countries, particularly the US, which relies heavily on communications and surveillance satellites to maintain an information edge over potential rivals. Beijing’s expanding space program and capabilities, according to the report, would undermine that advantage. According to the report, a launch in July 2014 renewed concerns about China’s development of "destructive" space technologies. It noted that while the launch itself did not result in any damage or destruction, it had a "similar profile" to a January 2007 test in which a defunct weather satellite was deliberately destroyed, leaving hundreds of pieces of debris orbiting the Earth. "The United States expressed concern that China’s continued development of destructive space technologies represented a threat to all peaceful space-faring nations, and was inconsistent with China’s public statements about the use of space for peaceful purposes." The report additionally details an incident in which China sent an unidentified object into space in May 2013. "China launched an object into space on a ballistic trajectory with a peak altitude above 30,000km [18,641 miles]," it said. "The trajectory took it near geosynchronous orbit, where many nations maintain communications and earth-sensing satellites." "Analysis of the launch determined that the booster was not on the appropriate trajectory to place objects in orbit and that no new satellites were released," the report added. The mysterious object was in space for nine and a half hours before re-entering Earth and, while it has yet to be identified, the report goes on to suggest that the launch could have "been a test of technologies with a counterspace mission in geosynchronous orbit." Concerns about threats to US satellites have already prompted the Obama administration to propose an additional $5 billion in extra spending over the next five years to maintain the security of the country’s military and spy satellites. "The US government is providing more details on Chinese counterspace activities than they have in the past," Brian Weeden with the nonprofit Secure World Foundation said to Reuters. "The Pentagon is clearly increasingly alarmed about China’s growing space capabilities and counterspace capabilities." China Developing Orbital Transfer Vehicle like X-37B . It is nothing like the X-37B, much bigger at least 3 times bigger . China is making progress in building an "upper-atmosphere" jet fighter, an official said last week, adding to a flurry of speculation about China's growing air power. Hong Kong's Ming Pao daily on Tuesday said Shaanxi TV last Saturday quoted acting provincial governor Zhao Zhengyong as saying China has "succeeded in the test flight of a prototype aircraft that can fly through the atmospheric layer." Zhao was visiting a state-run aircraft corporation at Xi'an high-tech industrial development zone. The channel showed images of a prototype space fighter being assembled whose outward appearance was almost identical to a U.S. pilotless upper-atmosphere military spaceship, the X-37B, the daily said. The daily said China's development of the aircraft was leaked to the pres like recent stories about its new stealth fighter dubbed the J-20, but authorities were "deleting all Internet posts about the space fighter." 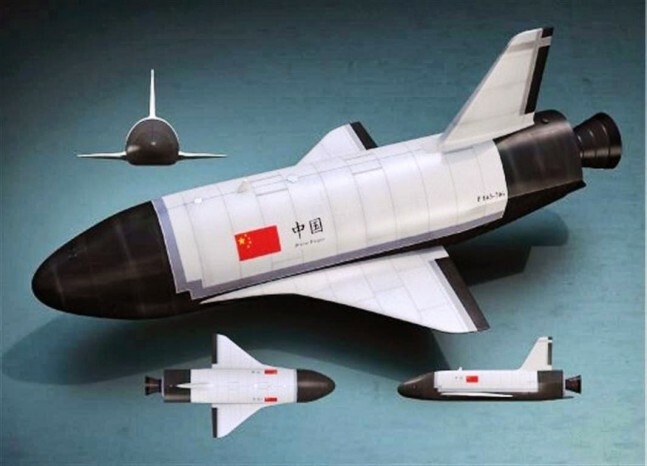 The Ming Pao and the Zhongguo Pinglun (China Review), a news website in Hong Kong, posted an article headlined "China succeeds in spacecraft test flight in tandem with U.S. X-37B" until early Tuesday, but no mainland Chinese media websites mentioned anything about it. China's Yuanzheng-1 Unmanned Space Vehicle has the capacity of delivering more than 10 satellites to orbit. Not to be outdone, the United States is currently planning on launching the fourth flight of the U.S. Air Force’s Orbital Transfer Vehicle (OTV) space plane later this year. Some sources have stated that China plans to launch as many as 40 spacecraft, during the course of 20 separate launches, in 2015. This was announced at the annual meetings of China’s parliament, as well as by the nation’s political advisory body earlier in March. The Party Secretary for China’s Academy of Launch Vehicle Technology, Liang Xiaohong, has stated that the Yuanzheng-1 is capable of operating for about 6.5 hours on orbit. China foresees the small spacecraft as important toward its efforts delivering multiple payloads to orbit as well as clearing space debris . Soviet Union’s Buran spacecraft flew its only mission completely automated in 1988 . Now where is Russia's OTV Buran ? They stopped the test flight ? Buran was a counter to the US Space Shuttle because the Soviets believed it had military value as a space bomber. With experience they found it would be easier to just strap warheads to an Energyia missile than use the Buran Glider and so the funding stopped. The Space Shuttle has many excellent features, but ironically despite its name it is horrendously inefficient as a shuttle to an orbiting space station. Much cheaper to use smaller disposable rockets. On the other hand to deploy or recover satellites the shuttle is far superior. Would point out there is no permanently dark side of the moon, just like there is no permanently dark region on earth. The so called dark side is the side we never see from earth because the moon rotates on its axis at roughly the same speed it orbits earth so keeps the same side facing earth all the time. Admrial Cecil D Haney, the commander of US Strategic Command, told Gertz of his concerns about the buildup of Russia and China's nuclear forces. He also said terror groups like the Islamic States may launch sophisticated cyber attacks against the United States. Haney said further that the United States should take seriously the prospect of a Chinese attack against its satellites in orbit. "The threat in space, I fundamentally believe, is a real one. It's been demonstrated," Haney told Gertz, saying that China's first anti-satellite missile test in 2007 created tens of thousands of pieces of debris and the country has continued to carry out anti-satellite tests until July 2014. Last year's test did not create debris however because China did not do a "hit-to-kill kind of thing," Haney said. Gertz said the anti-satellite missile used during the test on July 23 last year was identified as the DN-1 by the Pentagon. China has a second anti-satellite missile known as the DN-2 which was tested in 2013. This missile is developed to hit satellites in high-earth orbit, where intelligence, navigation and targeting satellites are positioned. Haney said the US has already taken steps to deal with this new kind of threat. Really ? What exactly US will do if chinese try to destroy ussa recon sats ? The Obama administration's budget for fiscal 2016 contains adequate funding for investment in space protection capabilities, according to Haney. These defenses are mainly described as passive, including "space situational awareness," or intelligence on space threats. Haney said tactics, techniques and procedures for space defense should also be developed. When asked about developing offensive space capabilities, Haney said it will be included into the space protection program.